With my upgraded status we can now modify the forums to better suit everyone's needs. So what I am asking for is ideas. Don't like the way something works? Let me know. Have a great idea? Post it here and we might be able to implement it. Think something can be done a better way? Well lets do it. While I can't promise that everything everyone suggests will be implemented, we can at least have a good discussion and see if it is viable. So post your thoughts. Go! #1 Implement a google search instead of whatever this built in one is. Definitely a good idea, i will look into it. well I'll rack my brain and try to come up with something useful but for now I'll just say that splitting each board into per game sections would be immensely helpful. I dunno how tough this would be though, probably be a lot of manual effort involved I would imagine. You have no idea. Plus the hierarchy would be difficult to navigate. Not to mention i don't think child boards can have child boards. Can't do the silver stars. Could give you two rows of blue stars? I'll take it. Curious if you've also been given enough power to assign future moderators? I suggest we limit avatars more by filesize than resolution. I think 120x120 and 50kb would work well. That's the best everyone could come up with? 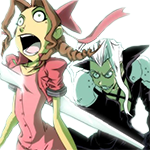 Bigger avatars so Jenova's Witness could show some skin ... and pickles? I guess it is not a big deal since none of the avatars are hosted on Qhimm, and I am sure 99% of us are on some sort of broadband. Be warned that anyone who abuses the avatars will have the privilege of them removed. I take it the google searchbar was a failed attempt? Adding any packages to the site requires access that I do not have, so unfortunately Google Search is a no go. I would also love an improved search, the current one is horrid. When I send a PM now, it doesn't show up in 'sent messages'. I cannot do anything about the search at the moment unfortunately. Goto your profile and turn on 'Save a copy of each personal message in my sent items by default. ' under Personal Messaging. Hmmm, yes. That has annoyed me for some time. Ill take a look into it. Request: New maximum size for avatars. I can't think of anything terribly original, except maybe FAQ maid/mods whose only responsibility is to comb through old posts, add answers to various FAQs, and then delete the old posts. Though I don't know enough about FF7 to know how these FAQs should be organized. This is strictly a housekeeping idea, but it would be nice to have answers to every question ever asked in a neatly organized and searchable form. I do like this idea, but good god that is a ton of work. There are currently exactly 8051 threads and 108,070 posts (not including completely unrelated). There's just no way without dozens of people working on it and an extreme level of organization. Would be helpful though... people looking for help with FFVII High Resolution Patch could be deleted, and other posts like that. It's just too much work for very little benefit. On a somewhat related note, I have always toyed with the idea of no longer having post counts or stars even. They should have come up with ideas that will really help the forums, like letting you give yourself more stars. Primus: Hey guise, how do I x? Secundus: You can x by ying your z.
Tertius (who has Secundus on his ignore list): You can x by ying your z.
Secundus (who, unbeknownst to him, is on Primus' ignore list): You can x by ying your z.
Tertius, Quartus...nsimus (aside): The question has been answered, so let's not bother repeating anything. Primus (aside): Why is no-one answering my question? BAWWWWW! This is is the lesser of two evils on social forums, but it seems like a bad idea on a technical one. As for positive suggestions, I'd like to repeat the calls for a better search option (the current one is worse than useless) and a review on avatar restrictions. 100x100px and 10KB is from the days of dial-up and is no longer necessary. Instead, the focus should be on preventing obnoxius and distracting avatars rather than ones with a big filesize. Allowing avatars beyond 150x150 and long animated gifs will make threads unpleasant to read, but something like a 120x120, 20KB avatar should be fine. I'd advocate at least doubling the filesize limit (but not going beyond 50KB, so that unnecessarily long gifs can't be used) and setting a size limit of something like 120x120px or 150x150px. Anything huge would be distracting. But wait, I have another negative suggestion! I feel the need to inb4 sigs. Signatures are the cancer that is killing the intertubes and have no function other than ego stroking and making stuff half to read because threads are walls of signature with tiny amounts of text in between. No-one ever reads them, anyway. I know that no-one has suggested sigs, but I'd like to voice my opposition to them in advance. I can't think of anything terribly original, except maybe FAQ maid/mods whose only responsibility is to comb through old posts, add answers to various FAQs, and then delete the old posts. A meido-san? Uwaaa! Can we dress her up in a French maid outfit with nekomimi and a tail? I like this idea! Well of course thats why I did this, just so someone suggested I have more stars. Ignore Members: As for the ignore member function, in my opinion it should stay as it is. Some people just cannot get along. Search Engine: Ill look into seeing what I can do to improve the one on here, within my abilities that is. Avatars: I think 150x150 50kb is a decent maximum. Assuming an approximate amount of 10 posts per page it will be at max 500kb to load. Which should not strain anyone's internet. Can anybody test for me if a 150x150 avatar works as is, or if i need to change anything? Signatures: I totally agree. Signatures are not needed and will not be turned on. Just tried a .gif 132x148 avatar at 16kb. Failed. Sou nan desu ka? Well, if people make fools of themselves or miss out on valuable information because they were too hasty with the ignore button, they'll have no-one to blame but themselves. I totally agree with your second statement. edit: Ok someone try an avatar again.